Founded in 1908, the Burlington Concert Band continues to bring audiences a unique blend of musicianship, enthusiasm, and community spirit. The band, comprised of local volunteer musicians, plays a wide variety of musical styles and repertoire. Our band is unique in that we primarily perform to raise money for charitable causes. 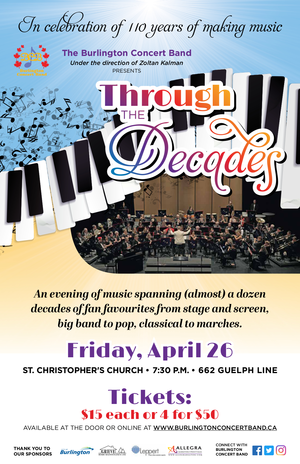 Over the years the band has raised over $40,000 for local charities and has built an audience of over 2,000 fans. The band continues to grow to this day. The Burlington Concert Band is located in Burlington, Ontario, Canada, and encourages you to become involved in our organization. Tickets for our annual Spring concert are now available for purchase ahead of the concert itself. Click here to purchase tickets at $15 for a single ticket, or a block of four tickets for $50. The Burlington Concert Band is honoured to participate in Natalie Medeiros' project about community bands in the Greater Toronto Area. Click through below to learn more about community bands, and why we do what we do!